Follow the Meet an author Monday host (Lisa Sanchez) along with any of the wonderfully talented authors on the list. I’ve been asked about how I write on several occasions. Each writer has their own quirky behaviours, their own rituals and methods of getting the job done. Every fiction writer is on a different train with the same destination. We all want to end up with a finished piece we can be proud of. Charlotte holds notes and scenes from Shades of Avalon, the sequel to Shades of Atlantis. Investing in good quality paper and ink makes me feel I am investing in the story. Generally the finished manuscript will end up nothing like the writing on these pages. It’s an out of order, rough, basic and almost illegible stream-of-consciousness type of writing. From here I move onto a word file. I attempt to decipher my hand written scenes and shape them into a form that will, in some way, resemble they way I see it happening in my head. This is my second draft and it’s never in story order. I work on key scenes going back and forth to add and remove details as needed (Bill and Ted) to make the plot flow and the characters three dimensional(I hope). Then it’s onto third draft, this is an important one. This is where I add transitions from one scene to the next and add any minor scenes required to make the story as seamless as possible. At this point everything is still rough but is slowing forming. I will go through another couple of drafts to get the story as clear as I can before I move into editing. By now I’m usually on draft six or seven, sometimes more. This is when I pay attention to active voice, spelling, grammar and punctuation. The next step is for someone to read it, in my case my brother and sister-in-law get first viewing, then a couple of writer friends I trust. I go through everything again… and then again… and then again until I’m happy. Then I find something else to tweak. Eventually though, it’s time to send the manuscript off into the world. On both Ember and Shades there was a lot of work still required during the editing process once they were picked up for publishing. Creating a manuscript to submit is only the first step. Writing is hard work, anyone who says any different usually isn’t a writer. All we can do is our best and hope readers don’t hate it. Having said all that, the pleasure of holding a book in my hands or hearing someone say that something I saw in my head and put to paper brought them a few hours enjoyment is enough to make it all worthwhile. YA Bound will be hosting a blog tour for Ember. If you are interesting in reviewing Ember as part of the tour, this is where you can sign up. I can't believe you've named your journals Edgar and Charlotte, hee hee. I love to learn how authors approach the process so uniquely. Good luck on those sequels! Oh, I love this! 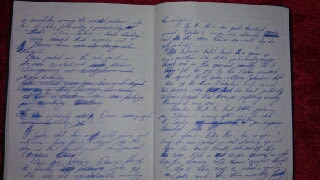 Those journals are awesome =) Thanks for letting get inside your head, I'm taking notes! How awesome to actually get to see your journals. Adorable names. ;) I'll bet unlocking that stream of unconsciousness with no bounds helps keep the creativity flowing when it comes time for every other step of your process.